Read 3 times. Last read January 20, 2012 to January 24, 2012. Did you change your rating of this one? No. I rated it 4 the first time I read it. I'm guessing that you are re-reading this? Well, I will be interested to see what new info you are able to glean from a second reading. I may have to re-read it myself sometime soon. I tend to remember the books I loved in great detail, it's the ones that I don't care for that I get a little fuzzy on. Hmm, well, I disagree with your review, but it was well done. I didn't realize you were so pro marriage. Hmm, well, I felt she was committed to him, she just wasn't going to marry him, but we have been through this, we could go round forever with this one. I do however find it interesting that you aren't taking into consideration that Katsa is 18 years old and has been bound by men her entire life until present. Even if Katsa weren't abused by her uncle, I can see why she wouldn't want to marry the first guy she falls in love with. I think she'll become more committed over time as she matures and deals with the various bad hands she's been dealt. I also think that things in Po's father's kingdom are very different than things are in Randa's kingdom, possibly even what is expected of a wife. Yeah, I know:) I won't even going to try to make you change your mind. We both have different understanding what commitment is to us. I personally wouldn't agree to that arrangement. Po: I love you Katsa, but I will never marry you or share your princess life with you or let you have my kids. As soon as I am back from my months long journey, I will visit you and we will go around on our coucil business. But I will come and go as I please because I am my own man and can't be tied down to anyone and I don't think I should stop you from loving someone else either. Katsa: I will take whatever you can give me. Heather wrote: "I do however find it interesting that you aren't taking into consideration that Katsa is 18 years old and has been bound by men her entire life until present. Even if Katsa weren't abused by her u..."
Well, I do think their world and their circumstances make them mature faster, a la Fire but Katsa has never been allowed to be herself. She was like a caged animal, never got to discover who she was, etc. I can understand her not wanting to fully invest in a relationship with someone until she is fully herself. She is still figuring things out for herself. Even though she has been out of her uncle's thumb for a little while, she still had to do a mission. The end of Graceling was the first time she could think about what she actually wanted to do as opposed to what she had to do. So again, I can understand her not wanting to trade one obligation to another and despite what everyone says, when you are married, you are obligated by being decent to consider another person, at times more than you consider yourself. I completely agree with your last statement. I especially agree with this: "I can understand her not wanting to trade one obligation to another and despite what everyone says, when you are married, you are obligated by being decent to consider another person, at times more than you consider yourself." This is exactly why I am saying Katsa is not fully committed or emotionally invested in her relationship with Po, because real partnership (I will avoid word "marriage" here as it doesn't have any bearing on my argument) involves a lot of give and take, consideration, and sometimes sacrifice. Nothing wrong with that really, it's just not really love, it's more of friends-with-benefits/occasional lover arrangement. I think that this is where we disagree then. I think you can love someone and still not be ready to be 100% selfless. Just because she isn't ready to give him everything doesn't mean she is giving him nothing. Love isn't absolute. I'll use myself. I loved Chad from the start and new I wanted to be with him but I didn't marry him the second I knew that because even though I knew that was how I felt and how I wanted to end up, I was enjoying where we were at and wasn't ready for something I knew would come in time. That didn't change how I felt about him. It just grew stronger and more powerful. I think Katsa loves Po very much, more than anyone, and she wants his happiness, she just isn't ready for the whole kit and kabutal. 1) she repeatedly says: I will never marry you, I will always be my own woman and do as I please, no ifs or buts, no sign of her ever changing her opinion about it or considering his opinion about the arrangement. Po can either agree to it or take a hike. She has all control of the relationship. 2) she says she doesn't want to tie herself to him and stop him from meeting someone else. If Katsa said: I love you, but I am not ready to settle because I want to explore the world first. I want to be with only you and I need you to give me time to be ready to fully commit (it doesn't have to be a marriage) - this would have been a completely different story for me. 1. She may not ever want to get married, IDK. But I don't think that her not wanting to get married means that she is not committed. As I have said, the two aren't mutually exclusive. I was 100% committed to Chad, there was noone else and I wasn't looking for anyone else and we were never married. Also, if Katsa has all the control in the relationship, it is because Po gave it to her. If he wants it back, he should go get it. 2. I saw this as Katsa trying to be fair and do the right thing by Po. Again, I'll use myself as an example. I was 100% committed and in love with Chad and part of the time we were together, I was still in school. Now, say I really wanted to go to Europe to study abroad for 6 mos. Would I want Chad to stay with me, yes, would I want to return to him when I got back, yes, would I ever cheat on him, no. But, technically, I would be leaving him behind. I would be physcially gone for 6 months, and things happen, people change, or you meet new people and even though we are committed, we are not legally obligated. It would not be fair of me to demand that he not persue something with someone else if he happened to meet someone, cause I made the choice to study abroad. I think that is what Katsa meant. That she may be leaving to do her thing, but she loves him and is committed, and while she hopes he won't meet and fall in love with someone else, she is acknowledging the possibility that it could happen and she is letting him know that she understands that and wouldn't resent him for it because it would be partly her making. That she understands that by them not being married, he doesn't owe her anything. 3. Yeah, I know, but Katsa isn't so good with words, especially when they are about feelings, lol. I am just going to say the last thing - whatever you are trying to prove here using yourself as an example just shows that Katsa is too young to actually make a decision about her future with Po, which is understandable. But what Cashore apparently insisits upon in her book is that this kind of arrangement can substitute marriage/ long-term partnership. I am just saying that in reality relationship as Po and Katsa have right now can't sustain itself for long. To ensure our love birds stay together, it is mandatory that Katsa grows up and changes her mind about some things, Cashore doesn't indicate that it will ever happen. In short, Cashore has no promise of Katsa ever growing emotionally. Yeah I disagree with that too, lol. I don't think that there is a substitute for marriage. But...I don't think that marriage is the only way to stay with someone forever or to sustain a relationship. I don't think it is necessary. I think you make commitment with your heart and mind, not with paper. Curious, how does my using myself as an example prove that Katsa is too young? Heather wrote: "Curious, how does my using myself as an example prove that Katsa is too young?" It's nothing personal, I probably should have re-phrased it. What I meant was - according to your answers, at the time when you were with Chad you would have made the same decisions as Katsa, mostly because you were young and in school, but you never ruled out marriage or at least moving in together as the time progressed. Or that 6-months travel woould have been OK as a one-time thing, but a long-term relationship can't be long-distance. And I am even more sure that if you stayed/lived with Chad for several years, you wouldn't be suggesting that he is free to look for love on the side. That I agree with completely. I do not think that Katsa and Po can sustain a permanant relationship where one or both of them is away for long bits of time. Regardless of how in love you are or how committed, that lifestyle is not meant to be long term. If she wants that lifestyle long term, then I agree, Cashore has messed up. I didn't see Katsa as knowing what she wants long term, only short term, so perhaps that is why I'm not bothered by her choice. I guess we'll have to wait for "Bitterblue" to see what actually happens to those two. I really am looking forward to Bitterblue. I think Cashore is a very talented writer. And it will be interesting to see what has become of Po and Katsa. I just wonder how far into the future the book will be set? I read somewhere it's 7 years after Graceling. You know, I would really like for her to write and AF novel. I think she would do a marvy job at it. And her views are rather drastic for YA. While I'm not bothered by them, most teenagers are still very idealistic and believe in the HEA. I'm glad that there is finally a YA author who defys the norm but I think she would be better receieved in AF. I think she should attempt AF. I don't think her views are drastic, rather her characters never act like teenagers or kids. Not even 10-year old Bitterblue. YA normally centers on ever changing and developing young minds, and most of Cashore's characters are fully formed and unyielding in their views on life. If you remember, when we discussed Fire I told you that Fire makes decisions as she is a 30-year old woman. Whatever Fire and Katsa decide to do in their lives would be fine with me, if they were adults. But as teenage girls making very serious life-altering decisions they seem unreasonable, immature and too rash. I'm trying to grow as a person and work on my need to always be right, and also, I happen to agree with your last statement. Don't worry, I'm counting one for myself as well, lol. I am eschewing my saucy wenchiness with a firm hand, lol. I heard a lot about this book so I have been reading many reviews on it. The story line seems really original and interesting but in many reviews it says that the character isn't strong and doesn't develop. I'm starting to make my summer reading list so do you recommend I read this book or is it not that great? I also hear there's another book called Fire. Does Graceling have an ending or will I have to read the next book? I think you should read Graceling and see for yourself. I enjoyed the book in spite of the issues I had with the characters. Fire is not Graceling's sequel, but rather its companion. 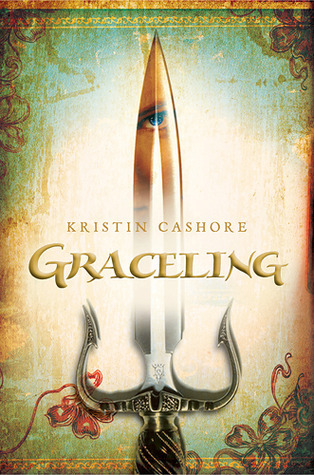 Graceling is a completely independent book and has a definite ending. Katsa is definitely flawed, but I think it makes me like her more in a way, and I liked that Cashore chose not to wrap it up too neatly. It also so rare to see a young woman make a different choice for a change, it just does not happen very often in YA, and I think it is important to have different perspectives out there. Tatiana, I felt pretty much the exact same way about the marriage issue as you did. I gave this five stars (but the romance part is more of 4 stars). It wasn't successful because I don't think Katsa truly grows as a person, as you stated. Thanks for your eloquence. Great review. I am also curious as to what will happen with Katsa and Po in the next book. I couldn't agree with you more! I loved the book and found Cashore's writing absolutely engrossing, but those issues you commented on were the very things that plagued me through the whole book. And I'm with you -- I think it was how Katsa's refusal to commit to Po in any way was lauded as a triumph of feminism that bothered me the most. Surely, that's not the only way to be a strong, independent woman. In fact, it just sounds like an unhappy, independent woman destined to be alone to me. Jami, you took the words out of my mouth! Hurm. She should have just got with him. Getting with a nice man is NOT anti-feminist to me. Why, if I had some nice man like Po who was like, let's get together and he doesn't have anyone else I would get with him but he'd have to allow me to have my own space. Because women do so need caves! At least THIS ONE DOES! Tatiana, this is a great review. I love how you're able to write such cogent reviews and do it without rambling...which is what I do :S. And I'm going to go back now and try and rewrite my GRACELING review, too! Kendra - I never thought to see it that way, but you're right. I was so busy being annoyed by Katsa's attitude that I didn't try and understand why she felt that way. Great point! Thanks, Amelia. Isn't it amazing how just a character's personality can affect your whole reading experience? Was it your first read of Graceling, BTW? "The way I see it, there is a fundamental flaw in Katsa's logic. This notion that marriage takes one's freedom, that once you unite with someone, your spouse controls you. This is not what I believe in. " I viewed this as part of the medieval fantasy setting of the novel. After the early middle ages, most freedom women had in medieval Europe was indeed at her husband's discretion. That's a bit of a simplification, but this isn't the place for a lengthy review. I saw this part of the novel as a realistic facet of marriage in this setting. The fact that Katsa thought about this tension seemed to be a way to show, not tell, her commitment to independence. She knew romance could theoretically sweep her away, but rather than passively react, she was proactively thinking through the ramifications. I see what you are saying, Sarah, and agree. I guess my problem is that even knowing Po as well as she does, she still thinks that commitment to him would impede her personal freedom, she, basically, never fully trusts him. Tatiana wrote: "Thanks, Amelia. Isn't it amazing how just a character's personality can affect your whole reading experience? Was it your first read of Graceling, BTW? And, Kendra, I never thought of it that way...."
It is amazing, I agree. It seems like the character's personality is the biggest thing that I think about and often get sidetracked because of it. And I read GRACELING way back in fall 2009. First time through, I really didn't like it, because I couldn't concentrate on anything other than Katsa. But I am going to make myself go back and re-read it, paying attention to things like the writing. Like you said, Cashore is a strong writer and she has a gift for storytelling. I hope that men don't have to overpower women in relationships, but modern cultures around the world and economic and physical superiority will always encourage them to do so, whether married or not. (I never found such a guy). So ideally I'd disagree with Kat maybe, practically agree. Keen eye to notice that observation, you.